As I sit typing this blog on a MacBook Pro, I think about an old PC sitting in my closet that I no longer use. Is there a Feel Good Friday solution for what to do with my old laptop? Of course there is! The best news is it will work for your old laptop too. Globetops is a non-profit organization founded by Becky Morrison which, according to their Facebook page, "connects people who have laptops they don't use anymore with someone in the world that needs one." So simple and yet, so awesome! The Globetops site says that "roughly 220 million tons of old computers and other tech hardware are trashed in the United States every year. 50% of those computers are in good working order." By donating your laptop to Globetops, you not only prevent your computer from flowing down the e-waste river, but you also empower someone to use technology to improve their lives and connect with the world. The laptops are distributed in Guinea, Haiti, India, Nepal, Brazil, Kenya and the United States. You can watch this video to follow the journey of a laptop and see how it works. 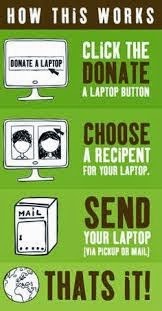 Much like Kiva, if you're interested in donating a laptop, you can either give it to the organization to send to any project or choose a specific recipient whose story moves you. Current people in need of your old laptop can be found here. While you're waiting for the latest upgrade to whatever you have, get excited to donate your soon-to-be-old laptop by reading the origin story of Globetops in this article from Daily Good or viewing this gallery of photos guaranteed to make you smile. Excuse me while I go dig through my closet.